I think to a certain group of people my age, the movie theatre was an important place in their lives. 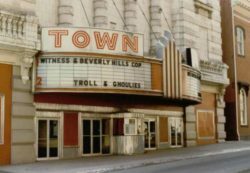 I often comment to younger people that in the 1970s and 80s, there wasn’t a movie theatre on every other corner and the ones that were there had, at the most six screens. If you were to ask me about a certain movie I saw between 1975-1985, I’m pretty sure I could also tell you what theatre I saw it in. I should also admit here that I worked in movie theatres, in one job or another, from 1977 to 2003. 11 of those years were spent in Baltimore, where, as a young manager, I worked in theatres ranging from a 900 seat single screen auditorium to a nine-screen multiplex (the largest complex I managed, in Kansas City, had eighteen screens). I can still remember vividly every complex I’ve worked in. Hell, if you asked me today I could tell you exactly how to turn off the lights in each one still. I highlight Baltimore theatres because this week a beautiful new book, one which takes a look at 72 different movie palaces from Charm City, will be released. Titled “Flickering Treasures: Rediscovering Baltimore’s Forgotten Movie Theaters,” the book is a true labor of love by author Amy Davis. From the earliest nickle-show houses to the current multiplexes, the history of each theatre has been carefully researched. Davis has conducted interviews with the people that not only operated these theatres but frequented them. Two of my dearest friends, D. Edward Vogel and the late Dominic Wagner, share stories of their days working in the grindhouse era. Baltimore-born filmmakers like Barry Levinson and John Waters also comment on their adventures at their neighborhood movie houses. Each story brings another theatre back to life, if only momentarily. The book also contains over 150 photographs, many in color, showing not only the theatres when they were open and vibrant but how they look today – providing they are still standing. I know for a fact that one of my old theatres is now a Walmart. Another a Kohls. Long gone but never forgotten. “Flickering Treasures: Rediscovering Baltimore’s Forgotten Movie Theaters” is available at Amazon.com and Barnes and Noble. For more information, go here.